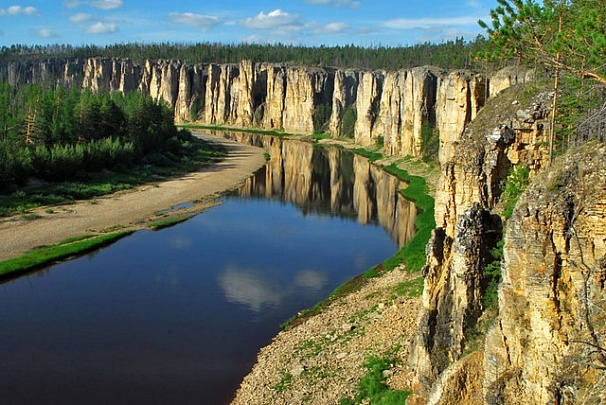 THE LENA RIVER is one of Russia’s great northern rivers, draining an area of 899,641 square mi (2,306,772 square km) and encompassing a region rich in wildlife and natural resources, including one of the world’s largest deposits of gold. This is also one of the most inhospitable regions on the planet, with extremes of temperature and vast stretches of northern forests (84 percent). Few people live in the region and there is only one city in the entire Lena basin, Yakutsk, the administrative seat of the former Yakut Autonomous Socialist Republic and now the capital of a semiindependent Yakutia, renamed the Republic of Sakha in 1991. The river, 2,850 mi (4,597 km) long, flows mostly through Sakha, but its origins are in the Irkutsk District, immediately west of Lake BAIKAL. Its tributaries have their headwaters in the autonomous republic of Buryatiya and the districts of Chita, Amur, and Khabarovsk. The river starts in the Baikal range, only a short distance from the lake itself, though the lake’s waters flow into the Angara River and into the Yenisey, thousands of kilometers from the Lena. It then flows north and east to be joined by its first major tributaries, the Vitim and Olekma, whose headwaters originate in the Yablonov and other parallel mountain ranges east of Lake Baikal (which are also the source of the headwaters of the AMUR RIVER). The river then turns again north in a large arc, following the contours of the Aldan Plateau to the south, from which emerges the Lena’s largest tributary, the Aldan, and the Verkhoyansk Range to the east. This range of mountains forms a steep escarpment for over 600 mi (1,000 km), stretching all the way to the Lena’s delta on the Laptev Sea, an arm of the ARCTIC OCEAN. This semicircular area bounded by the Aldan and Verkhoyansk highlands forms a sort of climatic vortex, producing some of the coldest temperatures ever recorded on the planet: -88.9 F (-67 degrees C). To the west the terrain is much flatter, with larger tributary rivers, notably the Vilyui, which extends far into the Siberian Plateau. From the confluence of the Lena with the Aldan, 800 mi (1,300 km) from the sea, the river becomes very broad, sometimes reaching 5 mi (8 km) across. The delta, covering 12,352 square mi (31,672 square km), is the largest in RUSSIA and third largest in the world. It is formed of numerous islets, marshes and sandbars. The largest islands (hundreds of square kilometers) are covered with damp, mossy tundra and frozen lakes that do not permit the construction of roads, so travel between the eight permanent settlements continues mainly by dogsled. The river is almost entirely navigable, with an abundance of fish, but is frozen eight months of the year. Ice has been measured at 53 in (136 cm) in the south, and up to 90 in (231 cm) at the delta. Because the Lena is almost entirely fed by mountain snows, spring thaws can bring disastrous floods, followed by equally breakups of river ice, sizable chunks of which can destroy entire sections of the riverbank and any settlements alongside it. The annual flow of the river is very irregular, with 90 to 95 percent of all of its discharge in spring and summer, when its volume increases by as much as 10 times that of the winter months. This irregular flow has limited the development of hydroelectric projects in the Lena basin, though there are two large dam-reservoir complexes on the Vilyuy. The Lena was used as a highway for trappers and traders in Russia’s expansion to the Pacific coast, with its main town of Yakutsk founded in 1632. Russia’s relations with the indigenous Yakut and Evenki peoples were not always harmonious, and the region saw a good deal of oppression, lawlessness, and unbridled greed in the race for lucrative furs. Another boom period followed in the 19th century, with the discovery of gold in the Lena valley near the confluence with the Vitim River. Privatization since the 1990s has returned the region to its “Wild West” frontier days, ruled by hustlers, speculators and black marketers. The 1 million inhabitants who live in the Lena basin are looking to their mineral wealth, still undeveloped because of great distances, difficulties building roads and buildings on permafrost, and difficulty getting water half the year.